The genres of fantasy and science fiction have long been a fertile place for illustrators, although the full value of their contribution is not always recognised. One illustrator who is now best known for excelling at luminous watercolours of fairies also helped to define the embryonic science-fiction market in the 1890s – although this is rarely remembered. Warwick Goble’s illustrations for H G Wells’s The War of the Worldsare artistically striking, chilling and astonishingly modern. They not only faithfully reproduce the writer’s descriptions, but also feature a “reportage” look that foreshadows many later sci-fi films (page 16). J R R Tolkien is similarly far more famous as a writer and creator of the all-encompassing world of Middle-earth, in which he set the Hobbit and the Lord of the Rings,than he is for the illustrations he completed for these books and other tales. Yet for him, the process of illustrating his imaginary places, books and objects was integral to the creative process just as much as developing working languages and mythologies (page 22). His illustrations are fascinating because they demonstrate how he saw the places he describes in his books, and, like Goble’s work, they have subsequently been interpreted to great effect in films. A century after Goble created his terrifying Martians, half mechanical, half tentacled sea creature, society continues to fear invasion by machines. Now, however, we are as afraid of the machines we create as we are of those sent from other planets. Dave Pressler has built a career from his illustrations, animations and models of robots, who move seamlessly from paper to computer screen, television and film (page 28). Meanwhile, cartoonist Martin Rowson is most commonly employed lampooning current affairs and world leaders, but his illustrations for the novels of Laurence Sterne demonstrate the way in which the human imagination has always mixed the familiar with the exotic, broken down the borders of reality and reassembled it to reflect society’s interests and fears (page 32). Fantasy provides us with a perfect place to reassess reality and illustration continues to play a vital role in helping us to visualise this. A brief round-up of current news stories, exhibitions and competitions	– plus new books, reader offers, catalogues and websites, auction highlights and dates you need to remember. When Sarah Edmonds started creating an illustrated town populated with places beginning with different letters of the alphabet, she didn’t envisage it becoming	a touring exhibition. Visitors who call in at the Story Museum in Oxford this summer, later see it in Brighton or Hastings, can contribute their views at the “visitor’s centre”and suggest their own additions as Alphabetown continues to develop. She	shows us the sketchbooks in which she records	on-the-spot inspirations for the project. Eric Ravilious and his close friend and colleague Edward Bawden were both pioneers in reviving the Victorian obsession with scrapbooks. Peyton Skipwith and Brian Webb take us through two newly rediscovered scrapbooks created by Ravilious and discuss what they contain, how and why he used them and reveal what his letters tell us about his attitude towards them. Warwick Goble created a unique, unnerving and atmospheric set of illustrations for H G Wells's classic The War of the Worlds, which are quite unlike the delicate watercolours of fairies he completed for his better know works such as The Water Babies and Green Willow. We learn why these images were so ground-breaking and how they have influenced sci-fi illustration and film ever since. The Lord of the Rings is, arguably, one of the most successful and popular books ever published, regularly topping readers' polls across the world. Much of its success lies with the author's comprehensive vision of the fantastic world of Middle-earth - from its history and landscape to its history and landscape to its languages and peoples. 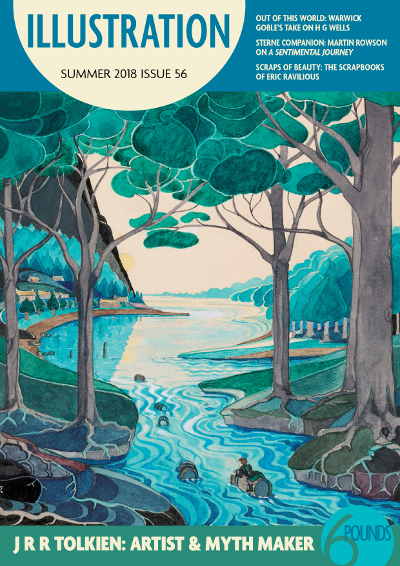 We discover why Tolkien's own illustrated maps and depictions of the places and artefacts of this world were as important to his creative process as writing down the events that happened in them. Animation is often a forgotten genre of illustration because so many animators' names are familiar only inside the film industry. As he opens a career retrospective exhibition in California, animator Dave Pressler tells us about his illustrations and the love of robots that led to him creating characters for Nickelodeon, The Jim Henson Company and Dreamworks, among others. Laurence Sterne's A Sentimental Journey has never been out of print in 250 years since is was published. Cartoonist Martin Rowson, who has just illustrated an anniversary edition of A Sentimental Journey, 25 years after completing illustration for the author's other major novel, Tristram Shandy, explains why everyone could enjoy having Sterne as a travelling companion this summer. For Swiss binder and publisher Josef Weiss, the traditional craft of book creating is both a perfectionist's passion and a family business - original paintings, wood-engravings and photographs by his wife and two sons appear in his publications. He show us around his workshop. Four young artists fresh from their MA degree courses at Cambridge School of Art and Nottingham Trent University discuss their current work, their inspiration and their ambitions for their future artistic careers. Illustrator and etcher Suzanne Balkanyi lived most of her life in Paris, after fleeing Hungary with her family during the second world war. Now her work is enjoying its first major UK exhibition since 1966 at Leicester Print Workshop. What are the key events, shows and exhibitions coming up in the next few months? Find out what you can't afford to miss.